In a week when the mainstream press focused on health care reform, the economy and the war in Afghanistan, the conversation on both Twitter and blogs was dominated by a very different set of problems-zombie attacks and cocaine on U.S. currency. For the week of August 17-21, the top story for bloggers was about Canadian researchers who conducted a mathematical exercise to see if a zombie attack would lead to the collapse of civilization. One-third (33%) of the top news-related links from blogs were to a single BBC story about the study, according to the New Media Index from the Pew Research Center’s Project for Excellence in Journalism. The same story was the No. 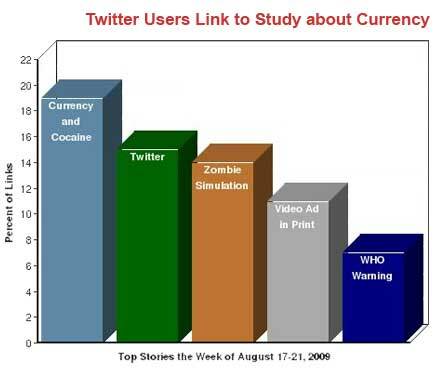 3 subject on Twitter last week, receiving 14% of the news-related links from tweets. The study authors claimed a serious purpose, saying a zombie "plague" might resemble a lethal spreading infection that could help scientists model what such a disease would look like. And while much of the online commentary was critical of the research, and even sarcastic, the attention to the topic seems to reflect an ongoing interest in social media in what might be called, for want of a better phrase, weird science. Over the past month, for example, some of the most linked-to stories by bloggers included an article about a meat-eating plant, research about the healing powers of blue dye found in M&Ms, and scientists who discovered that some cats have learned to manipulate their owners’ emotions. Another study that attracted social media attention last week came from a professor at the University of Massachusetts Dartmouth who discovered that 90% of U.S. paper money contained traces of cocaine. The amount of the drug found on most bills was not enough to cause health problems, but the prevalence surprised many observers. This was the No. 1 story last week on Twitter with 19% of the week’s links. And it was the sixth-largest story on blogs with 6% of their links. 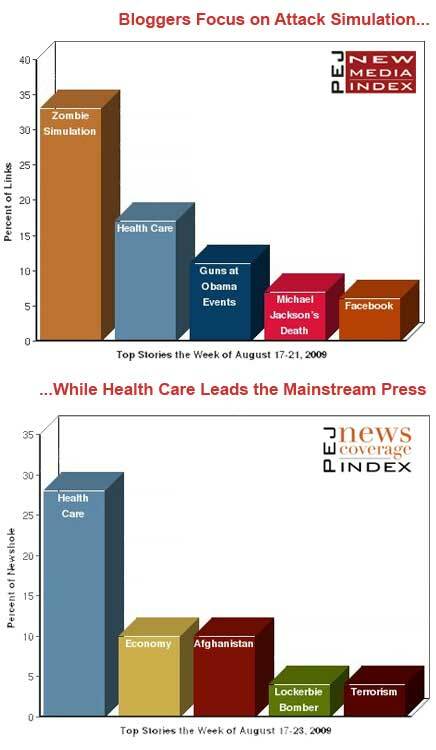 Beyond the zombie study, the second-largest story on blogs (with 17% of the links) was the health care debate-the topic that dominated the mainstream media last week. Most of that attention focused on an August 16 Washington Post column by Rick Perlstein who compared the outrage expressed by opponents of health care reform to other historical examples of "right-wing rage." Third (at 11%) was a story about protestors carrying guns outside of rallies held by President Obama. Fourth (7%) was a report that Michael Jackson’s physician, Dr. Conrad Murray, was going to face manslaughter charges in the pop singer’s death. And fifth (at 6%) was a CNN piece that detailed 12 types of annoying Facebook users. On Twitter, the second-biggest story was a study about the content on Twitter itself (receiving 15% of the links, according to the tracking site Tweetmeme) concluding that 40% of the messages on the site were "pointless babble." The next most popular stories were about the zombie simulation (at 14%), the first ever video ad to appear in a print publication (11%), and a warning from the World Health Organization that people with conditions such as HIV, TB and malaria should not rely on homeopathic treatments (7%). Last week was not the first time that zombies have made an appearance in the New Media Index, although the previous instance was dramatically different in nature. During the week of January 26-30, the second-biggest story on blogs was about pranksters who changed a Texas road sign to read, "Zombies Ahead." But if the purpose of the Canadian zombie simulation-which concluded that the zombies were a threat to civilization if not dealt with aggressively-was a serious attempt to plan for a worldwide epidemic, the reaction from bloggers was mostly disbelief and sarcasm. "How long have I had to wonder if it would be possible to hold them off?" asked From Stage Dives to Station Wagons. "How long must I wonder how best to improve my chances of survival? Why has science ignored this pressing concern for this long? Well, unfortunately the news isn’t good. Looks like the zombies would win and it wouldn’t even take long." Even the usually serious magazine Foreign Policy got into the act with a post that had some fun at the study’s expense. "This would give states a great opportunity to cooperate on the issue by quickly fashioning a World Zombie Organization (WZO) that would codify and promnulgate rules on how to deal with zombies," predicted Professor Daniel D. Drezner. Some observers who voiced doubts ended up seeing some value to the work. "On one hand, I kind of wonder how professors could spend time doing research like this," posted Jerry Han. "On the other hand, you can see where there would be parallels between this and ‘normal’ epidemics-plus the fact that, given the topic matter, these authors have gotten me to do something I haven’t done in years-print out and try to decipher a stats paper." And a few observers even used the study to make a political point. "Perhaps this is why the Canadian health system is allegedly on the ropes-research is being diverted into zombie research rather than more immediate threats to the population," suggested PAXALLES. "Perhaps this is Exhibit A on why we don’t want to adopt that model for US health care." On the morning of August 18, more than 875 tweets contained a link to the CNN story about the presence of cocaine on a significant portion of U.S. currency. That was by far the most links any singular story received last week. Many of those tweets that linked to the story included the same message-"RT @CNN 90 percent of U.S. paper money contains traces of cocaine." A number of the bloggers who focused on the story expressed concern over the finding. "Fortunately, or unfortunately depending on your point-of-view, most bills contain amounts too small to pose any health risk…" wrote Philip at You Offend Me You Offend My Family. "But again, you shouldn’t worry about this. There are worse things clinging to your money. A 2002 study published in the Southern Medical Journal found that 94 percent of bills tested contained potentially disease causing organisms like staphylococcus aureus so it’s probably a good idea to just get into a general habit of washing your hands after handling money. You never know where it’s been." "If that figure is anywhere near accurate it’s an astonishing discovery. How’s that ‘war on drugs’ going, by the way?" asked Pilgrim at Say Anything Blog. Others didn’t seem as troubled. "Americans aren’t greedy," proclaimed Lance Burri at The Troglopundit. "…we’re just addicted!" For the third straight week, the most-viewed news videos on YouTube demonstrated the abrasiveness of much of the country’s health care reform conversation. The top three videos all involved recent town hall health care meetings and the anger they spawned. The top clip was from CNN’s Larry King Live which aired a confrontation between Representative Barney Frank and a constituent at a town hall meeting in Dartmouth, Massachusetts. A woman in the crowd asked why Frank was supporting a Nazi policy pursued by Obama. Frank gave a pointed and mocking response when he replied by asking the woman, "On what planet do you spend most of your time?" The second video occurred during a town hall meeting in Las Vegas where a woman yelled "Heil Hitler" at an Israeli man who was describing his support for health care reform. "Do you hear this?" the angry Israeli responded. "She [said] to a Jew ‘Heil Hitler!’"
The third video was a collection of interviews with protestors who oppose health care reform outside of an unidentified town hall meeting. At one point, a man claims that his wife, who is in a walker, was assaulted by liberals several days earlier. "The liberals are the violent ones," he asserts. "When you don’t agree with them anymore, all they know how to do is take it out in physical violence."